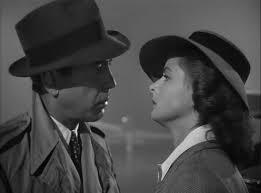 Casablanca – Did You See That One? 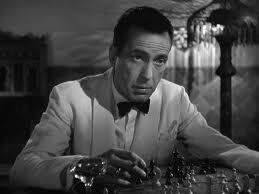 Rick Blaine (Bogart) is a man without a homeland during World War II. 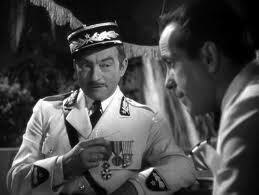 As an expatriate he’s settled in Casablanca and made a living on the black market. 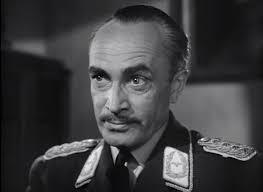 When a valuable set of letters come into his possession he’s quickly sucked into a game of cat and mouse with Nazi Major Strasser (Conrad Veidt) and police captain Louis Renault (Claude Rains). Things are further complicated by the appearance of his old lover Ilsa (Bergman) who has arrived in Casablanca and stirred up old feelings. As the pressure builds Rick is forced to act to avoid losing everything he has. Some movies are classics and others define the word. 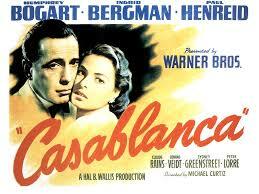 Casablanca is a landmark for most movie lovers with the timeless quotes and classic songs. I’m not sure, but “Here’s lookin’ at you, kid” never sounded as good as when Humphrey Bogart (The African Queen, The Treasure of the Sierra Madre) lets it fly throughout this incredible film. On the receiving end is the incredible Ingrid Bergman (Gaslight, The Bells of St. Mary’s) whose style and grace make her the perfect siren for her mysterious Rick. The addition of Conrad Veidt (The Cabinet of Dr. Caligari) and Claude Rains (Mr. Smith Goes to Washington) further built an impressive cast. Thanks to director Michael Curtiz (Yankee Doodle Dandy), the movie comes together with precision and intensity worthy of the great screenplay. All of this success led to Oscar wins for Best Director, Best Picture, and Best Writing. The film also earned Oscar nods for Best Actor (Bogart), Best Supporting Actor (Rains), Best Cinematography, Best Score, and Best editing. In addition to the awards, the movie is one of the most critically acclaimed films of all-time, with a place on the National Film Registry. The acting is superb in this dark drama. The actors all seemed to find the right niche for their characters. Bogart is the comfortably aloof Rick until his emotions are exposed. He also has a very wonderful understated anger that only surfaces in the most subtle of ways. 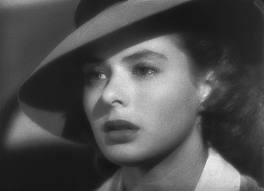 Ingrid Bergman is equally wonderful as the mysterious and secretive Ilsa. Thankfully, the remainder of the cast all have a great feel for the setting and the story helping to tell this awesome story. If the acting and the story aren’t enough, you’ve also got the visuals in this film. The lighting, camera work, costumes, and sets are all incredibly designed. This creates a wonderful backdrop that is alive and active throughout the whole movie. Finally, this film has one of the more memorable songs from the history of American cinema. “As Time Goes By” is a timeless classic that plays a powerful part in the film. The score is also perfect for the story being told. All of the stars aligned for this classic film. If you’re a fan of the stars of this movie you’ll be thrilled with their work in this one. The movie is over seventy years old but it feels very relevant. If you love suspense or mysteries I think you should check this film out. I give this one 5 out of 5 stars. Pingback: The Cabinet of Dr. Caligari | Did You See That One? Pingback: Mildred Pierce | Did You See That One? Pingback: His Girl Friday | Did You See That One? Pingback: Dead Ringer | Did You See That One?